This cake was made for one of Rodney's bosses. As you can see, there is a word that has been removed from this cake, for obvious reasons. Jack is a pretty awesome guy - very laid back, very good at what he does and pretty funny too. He uses the F word a lot and it's kind of a running joke, especially when it comes to his birthday. One year everyone wore "happy (insert explicative here) birthday" hats. We tossed around ideas for this cake for a while. 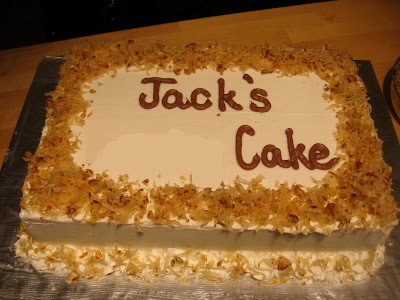 Rodney finallly convinced me that it would be funny to make a regular, very pretty cake with the words, "Jack's **** Cake" written on it. It took me a while to warm up to this idea. I wasn't too keen on writing the F word on a cake and I was terrified that people would think I was unprofessional. Rodney swore it would be fine and that everyone would think it was hilarious. Apparently they did. Rodney works in a creative environment. Very artistic, very fun and fun to be around people. Entertainment and advertising are a lot different than working for the Credit Union. Still. It was totally weird writing a curse word on a cake. 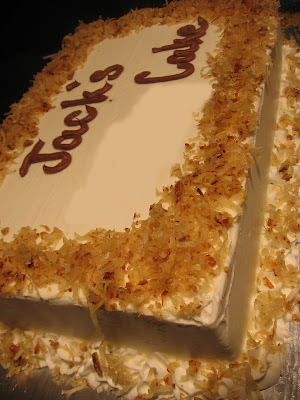 Jack asked for an Italian Cream cake so that's what he got!